The development of senior citizens has always been a concern for the central government. During 2003, the BJP government designed and developed a new scheme that aimed at offering a monthly pension to the senior citizens. But the scheme was not implemented due to several reasons. In 2017, this scheme was launched for the second time, with some changes in the original eligibility criteria and guidelines. With this scheme, senior citizens will get a significant figure as a pension. Financial security of the elderly – The main aim of this scheme is to offer financial security to the elderly. With monthly pension in their accounts, they will not have to worry about asking handouts from others. Assured pension – By investing a certain sum, these elderly individuals will be able to assure a certain sum in their bank accounts. This pension amount will remain fixed. Multi payout options – Applicants will be able to attain the payout in several ways. They can opt for monthly, quarterly, yearly and half-yearly pension payments. Mode of payment – The central government has announced that pensioners will be able to attain the pension via Electronic Clearing System or National Electronic Funds Transfer modes. Payment as per pension package – There are several pension packages to pick from. The pension amount will depend directly on the premium sum they have invested in this scheme. Return interest rate – This scheme offers a return rate of 8% on the invested premium amount. Family pension plan – If the pension holder wants, then the pension amount can be forwarded to the wife or husband or any other dependents. Refund on death – The total money that was invested by the applicant will be returned to the family members once the pension holder passes away. 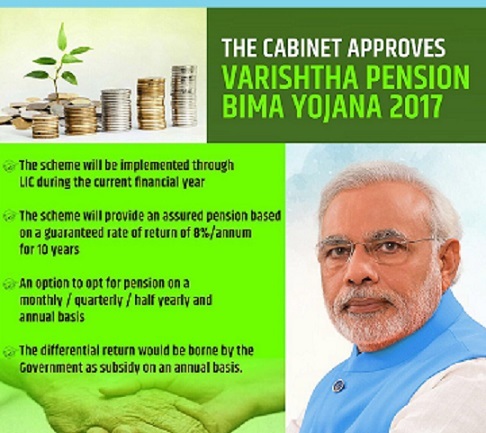 Maximum pension offered – Each pension holder will be able to receive as much as Rs. 60,000 on an annual basis. This means, each month, the applicant will get a maximum of Rs. 5000 under this scheme. Tax deduction – All applicants will get tax deductions on the total premium amount that they have invested in this pension scheme. Flexibility – The scheme has been designed in a manner that it easily ties up with other pension schemes like mutual funds, PF and endowment policies. Single premium – If the pension holder can afford to pay Rs. 6, 39,610 annually, then he/she will receive a yearly pension amount of Rs. 60,000. With one time premium payment of Rs. 6, 66,665, applicants will be able to ensure Rs. 5000 on a monthly basis. Indian and senior citizen – The scheme has been designed for only Indian citizens who fall under the senior category. Age criterion – Earlier, the lower age limit was 55 years. But now, this mark has been hiked to 60 years. It states that people who have completed this age will be able to apply for this scheme. There is no upper age limit to enroll under this project. Surrender tenure – In case the pension holder is not interested in continuing this scheme, then he/she will be able to surrender it. A pension holder can only do this after the tenure of 15 years is over. Loan facility – Applicants will also be able to attain credit against this scheme. The loan amount cannot be more than 75% of the invested premium amount. Only those people will be able to apply for this loan facility who have completed three policy years. ID Proof – Applicants will have to offer ID proofs. The PAN card, voter card and Aadhar card are some of the ‘must attach’ documents. Address Proof – As this is only for the legal residents of this nation, all interested candidates must attach a copy of their residential certificate with the pension application form. Medical Papers – All candidates need to attach their medical checkup reports with the enrollment document. Existence certificate – As this scheme is for the senior citizens, they need to attach a properly issues existence certificate with the application form. KYC form – The applicant will also have to attain and fill in KYC or Know Your Customer form. If any person wants to take part in this pension scheme, then he/she will have to log on to the official LIC site. From there, the applicant needs to click on correct links to download the online application form for Varishtha Pension Bima. Once the enrollment form has been downloaded, candidate needs to get a print out. This enrollment form is also available at the LIC office. After the applicant has collected the form, he/she needs to fill in the details. The applicant needs to provide personal and contact details. He/she needs to highlight the desired pension package as well. Information about the spouse or other dependents must be filled in as well. After filling in this information, the candidate must attach the necessary documents. Then the applicant must submit the form at the LIC office, with the premium amount. This scheme will offer a steady source of income to the senior citizens. Apart from meeting other requirements, they will attain medical benefits as well.